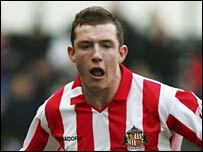 Hartlepool have signed Sunderland defender Neill Collins on loan until the end of the year. Collins, 21, started 11 games last season after signing from Dumbarton but has moved down the pecking order since the signing of Alan Stubbs. "Neill is wanted here - when he has got more experience," Black Cats boss Mick McCarthy told his club¿s website. Collins joins ex-Sunderland players Ben Clark, Michael Proctor, Darren Williams and Thomas Butler at Victoria Park.